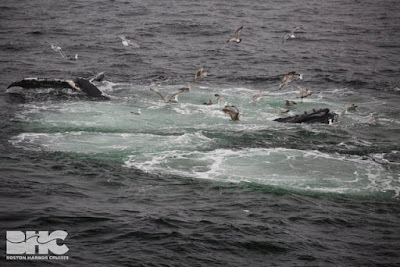 We embarked on another rainy day of whale watching this morning, but today we were accompanied by a fog that persisted through the harbor and out to Massachusetts Bay. Nonetheless, our spirits remained high as Captain Adam cautiously pulled back the engines upon noticing a large group of Bonaparte’s gulls that had appeared through the fog ahead of us. His instincts were quickly validated when, not a moment later, a kickfeeding humpback came into view. 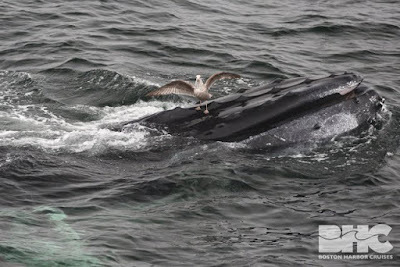 This solo humpback whale was none other than Sundown. Sundown has been on the kickfeeding grind for a couple days now and wasn’t the only hungry humpback still at it. 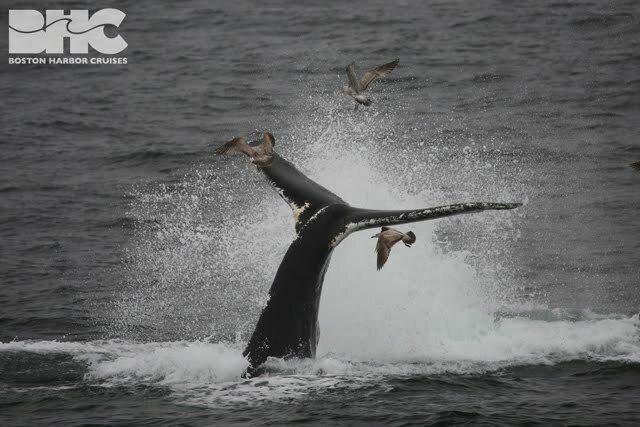 Nearby, Shuffleboard and Aerospace continued the same behavioral sequences we observed them displaying yesterday: a lobtail by Shuffleboard, followed by synchronized dives, with a duel bubblenet capture loop. A whale named Gumdrop (seen in the distance yesterday) captured and held our attention for the majority of the trip. 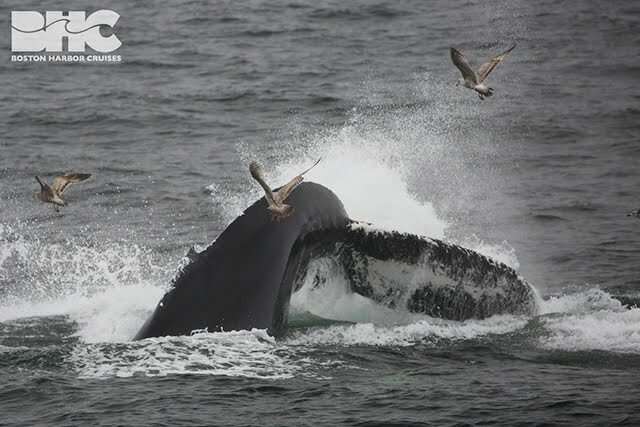 This energetic humpback fed aggressively, filtering mouthfuls of sand lance-stacked seawater. 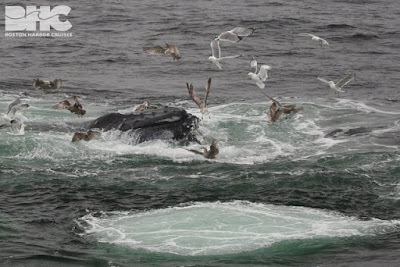 Gumdrop’s kickfeeding technique is characterized by powerful fluke kicks (see photos), large bubble nets, body snaking (see photo), and long periods of drag-filtering (see photo). 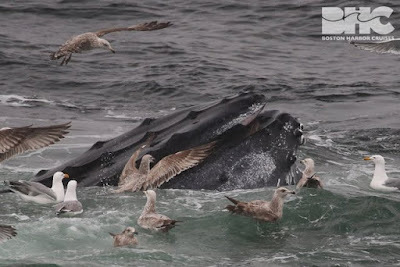 These extended bouts of dragging left Gumdrop’s head vulnerable to the abuse of many greedy gulls trying to jack a hopeful sand lance escapee (see photos). 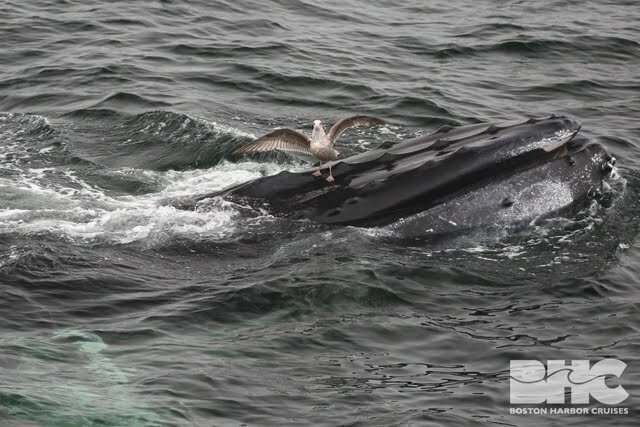 It’s amazing to me how unphased these giants seem to be by gull harassment, but a seagull riding a whale always makes for a comedic addition to a great day of whale watching (see photo)!